No kitchen should be without a toaster, and they are available at a bewildering array of prices, from about a tenner for a Tesco own-brand special to hundreds for multi-slot Dualit and Kitchenaid models. We are going to go ahead and assume you're in the market for something techy and high-end. However there are more affordable – but still stylish and effective – toasters in the list. They're for if you're on a budget, tight, or simply not that bothered about toast. For its blend of timeless design, renowned efficacy and longevity, we've gone for the Dualit Newgen. However, if you're after something much cheaper, Russell Hobbs' Legacy toaster does almost exactly as good a job, for a quarter of the price. But it's not as nice, though. Those who favour oddly shaped, artisan loaves should look at the Graef Long Slot, because it can take pretty much any size or shape of slice. Is it worth paying extra for a toaster? We reckon so, but then we love toast and we love cool-looking kitchen tech. Pay more and you get something that looks nicer, and should consistently make better toast, first time, thanks to greater controllability. It should also last longer, and will often make the toast quicker, although not always. Because toasting is a process of both cooking and drying, sometimes it pays to wait a little longer if you want perfect crispiness. Anyway, here are our favourites, in order of preference, taking into account of cost-to-quality ratios. Raise a toast to the best toaster a person can get. A pure, timeless, kitchen tech classic to sit alongside your KitchenAid stand mixer, this takes Dualit's commercial kitchen heritage and tidies it up for your kitchen. Browning and consistency are exemplary, and every part is replaceable and serviceable so in theory at least, the Newgen should last forever. The exterior does get kinda hot, a long-standing criticism of Dualits, but not hot enough to burn or anything mega bad like that. Obviously, you can buy far cheaper toasters that do almost exactly the same thing – in fact, there's loads of them in this very list. However, you can say the same thing about a Rolex, can't you? There's a choice of five colours, or purest, purist stainless steel. Available in two and four-slot guises, this makes superb toast, at speed, without requiring a hulking, great body like the KitchenAid toasters. The slots are mechanised, the options plentiful (for a toaster) and the whole look is pretty nice. The buttons are totally idiot-proof, without being patronising. They're clearly marked 'Quick Look' (lets you check up on your toast without cancelling the toasting process), 'A Bit More' (gives the finished toast a minute more, should you feel it's not quite perfect), and then there's buttons for frozen bread and 'Crumpets', which means it only cooks one side. The toasting slots are wide and deep enough for all but the chunkiest doorstops, while a stylishly illuminated countdown timer under the time setting slider lets you know how long till your toast is ready. A highly attractive design that, unlike some Smeg products, should sit well in any kitchen. Non-slip feet make the toaster stable on any kitchen surface and a removable crumb tray makes cleaning quick and simple. In a choice of five candy colours, or hard unyielding black, the Smeg TSF01 makes impeccable toast, with the usual 'premium' gamut of buttons for frozen bread and bagels/crumpets which, in the planet toaster manufacturers come from, are seemingly only to be toasted on one side. Automatically centering racks ensure your bread gets evenly browned on each side. The slots are pleasingly wide, too, while there's also integrated cable storage. Cheap, cheerful, makes four slices of all-but-perfect toast. What more could one ask? Russell Hobbs' (they were two people, you know) Legacy promises a "48 percent faster" toasting capability means that you don't have to wait around as long for your bread to toast. It's ideal if you're in a hurry in the morning or need to make several slices. If you're not after a 'premium' kind of device, this does the job well and it certainly doesn't look bad at all. As on pricier models there are buttons for frozen bread and bagels, the latter of which you will of course never ever use. 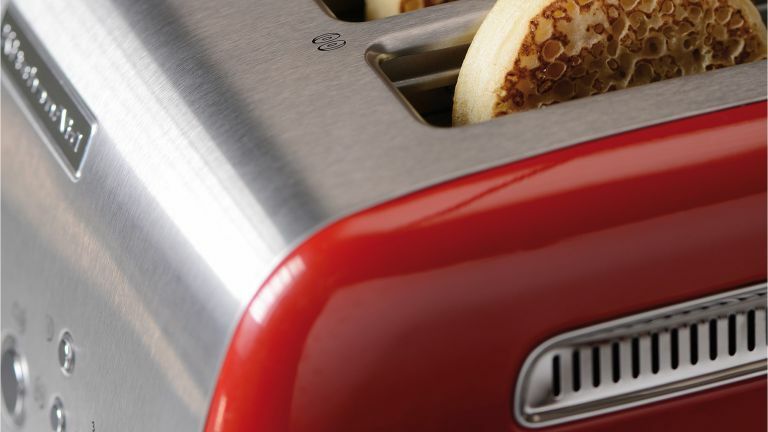 It also has wider slots which are great for toasting thicker slices of bread. The best value four-slot toaster I can find, this is actually very attractive from a distance, although naturally the build quality, when viewed at close quarters, is not as Panzer-like as your Dualits or your Sages. Anxious toasters can 'lift and look' to view the progress of cooking without having to terminate it, the slots are exemplary in both length and girth, and the toast that eventually pops out is undeniably even and toast-like. The slots are divided in two, with different controls for each, and there's the obligatory, if pointless, cook-from-frozen and 'bagel' buttons, plus the marginally more useful 'keep warm' function. Textbook. This oft-overlooked classic of the toaster world looks absolutely fantastic, with a fantastiche, mid-20th century Braun/Dieter Rams modernist look that can only be described as 'very, very German indeed'. It also makes fantastic toast, including from frozen, and isn't wildly pricey, at least compared to some of its rivals here. The long, wide single slot (or double on the 4-slice) mean you can put in bread of just about any length and breadth - a godsend with artisan loaves, though admittedly less essential if you favour Warburtons. A word of warning: the Graef is unusually slow, but then that is probably why it creates such perfect, uniform toast. German meticulousness and attention to detail win out, once more. The 4-slice version also comes with a rack for toasting 'buns and croissants'. We found it almost entirely useless for those tasks, but it does look nice. It's pretty obvious what the USP here is, but this is not just a gimmicky, one-trick pony, it's an excellent toaster. As well as showing you exactly how brown your toast is, it also boasts long-life filaments, a high lift mechanism on its wide slots, good browning and an excellent one-sided toasting function. It's a very well-thought-through, thoroughly effective toaster. In fact, the only drawbacks here are that when it doesn't have toast in, it looks kind of odd, and the glass does brown somewhat over time. Nonetheless, another premium, innovative toast master. Narrowly winning the battle to be the most insanely expensive toaster you can buy, this Artisan comes in a choice of seven colours on the 2-slice version, including the on-trend pistachio seen here and a ridiculously black shade of 'cast iron' black. Now, this is probably the best toaster we've ever used, and a hefty, hefty thing. It's got mechanised toast lowering and raising, the option to add an extra 30-seconds of cooking time if not quite done, the best "keep warm" function we've used, plus the usual, inexplicable bagel and cook-straight-from-the-freezer buttons. It makes excellent toast. Is it excellent enough to justify the price difference over the Russell Hobbs, let alone the Dualit or Sage? NB: the 4-slice version only comes in red or grey and costs north of £260. And while the 2-slice resembles a London bus, the 4-slice is about the size of one. From the cheaper end of the Dualit range, although hardly coming from the bargain bucket, this toaster looks cool, but in a more self-consciously modern way than your classic Dualit. Again there are two- and four-slot versions, with extra-wide bread cavities for chunky slices of toast. A 'peek-and-pop' function lets you see how your toast is doing without actually ending the cooking cycle. Interchangeable plates let you customise the look to suit your tastes. It feels weirdly insubstantial, especially compared to it's more expensive stable mates, but it makes solid toast, and has a way more contemporary look. I really cannot understand why De'Longhi insists on making toasters and kettles that are as disgusting to look at as they are excellent at toasting and boiling. Yet still, they do. The brand characterises this as, 'A futuristic outer shell made from transparent resin rings and finished with chrome accents for a contemporary designer touch." I describe it more simply: 'hideous'. But hey! It's at least not bad as its stable-mates, some of which are almost illegally ugly. Now, if you put a bag over its head, what you'd have is a really splendid, mid-to-high-priced, four-slot toaster with all the usual must-have/never-use features: cook-from-frozen, bagels and crumpets and keep warm/reheat. You can set different browning levels for two of the four capacious slots.